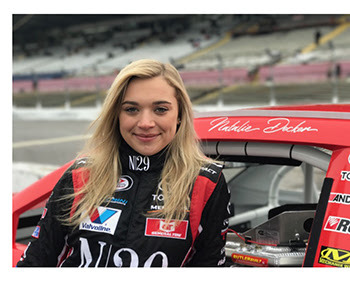 Concord, North Carolina (April 18, 2018) – Rookie contender Natalie Decker will make her third start of the 2018 campaign and track debut when the ARCA Racing Series presented by Menards returns to action in Sunday’s matinee running of the Kentuckiana Ford Dealers ARCA 200 at Salem Speedway. Decker, a fan favorite, started out the season winning the General Tire Pole Award and finishing fifth at Daytona and 11th at Nashville, expresses excitement and optimism headed into the weekend. Also to note, Decker’s Salem start will mark the energetic drivers’ 10th career ARCA appearance since jumping onto the scene last May at Toledo Speedway. Continuing her efforts to raise awareness about Distracted Driving, the 20-year old driver, will once again feature ‘People Against Distracted Driving’ (PADD) on the back of her bright red Toyota Camry at Salem. Decker, the National Spokesperson for the New Jersey based charity, along with her sponsor N29 Capital Partners, will continue to push the message during the month of April (Distracted Driving Awareness Month) and throughout the season. The Kentuckiana Ford Dealers ARCA 200 is live on MAVTV at 2 p.m. Sunday, April 22. Look for live timing, scoring and chat at arcaracing.com.